Your Kos itinerary typically began the previous day, on Saturday afternoon, when you arrived at the base in Kos to check in, provision the boat (if you hadn't elected to have us do it for you), and receive your pre-cruise chart briefing. Now that you've enjoyed a restful night aboard, it's time to head out onto the shimmering Aegean Sea to sail among the breathtaking Dodecanese Islands. Your first stop is the impressive volcanic island of Nisyros after an off the wind passage heading nearly due south. Nisyros is a wonderful place. Small villages perch at the edge of the volcanic craters, hot springs bubble and are said to contain healing properties, and the beaches on the island and surrounding islets are pleasant day anchorages. There are also castles and other historic sites to explore. Mooring: moorings are available. Because Nisyros is a volcano, its shoreline is uniform, steep-to, and hardly indented with coves. The two anchorages are at Mandraki and at Palon. Both are on the north side of the island and relatively exposed to the prevailing northerly winds, though Palon is better protected than Mandraki. By far the best anchorage in the area is three nautical miles to the north in the beautiful bay on the south side of the islet of Yiali. There is also a white-sand beach on the islet. Things to do: The port of Mandraki has many interesting historic sites, including the imposing Castle of Spiliani, built by the Knights of St. John during the crusades in 1315. The fortress also houses a medieval monastery. On the way up the hill to the castle, a visit to the Folklore Museum is intriguing. You'll see artifacts ranging from the everyday to the unusual, reflecting life on the island back through time. Just outside of Mandraki are all that remains of the castle of Palaiokastro and the ancient acropolis, which dates back to the 4th century B.C. Bus tours to the volcanic craters and the villages of Nikia and Emborios run regularly from Mandraki. Taxicabs are available. There are many hot springs and thermal baths. The most famous are Loutra Springs in Mandraki, Thermiani Spring in Palon, and Avaki Spring at Avaki Bay. There is a selection of tavernas, cafés, and bars in Mandraki and Palon. Facilities: Limited dockage is available at Mandraki and Palon. Water is available. Nisyros Island to Tilos Island - 18 nm. From Nisyros plot a course to the southeast, taking you farther down the chain of the Dodecanese Islands to remote Tilos. Off the beaten tourist track, this island is a splendid stop. There are good anchorages, picturesque villages, an abundance of historic sites including fortresses and monasteries, beautiful beaches, and several excellent restaurants. Mooring: No moorings are available. Located on the east coast at the southern end of Tilos, Livadia is the main but very small port. There is ample room to anchor in the beautiful bay outside the inner harbor of Livadia. The best anchorage is on the south coast in Eristos Bay, with excellent protection from all northerly winds. Things to do: Tilos is full of historic sites to explore, including the usual surplus of Byzantine churches and monasteries found on nearly every Greek island in the Aegean Sea. A bus service runs from Livadia to Megalo Horia, the capital of Tilos, with 160 year-round residents. Taking a ride to Megalo Horia to amble down the narrow lanes of this mediaeval town and to visit the Fortress of Misaria built in 1366 by the Knights of St. John is a fun way to spend an afternoon. The fortress perches on a hill above a plain that stretches all the way to the ancient harbor at Eristos Bay. Below the fortress is the famous Kharkadio Cave. People have lived in the area for at least six millennia. It's a remarkably beautiful part of Tilos, with citrus groves irrigated with fresh water from springs. In fact, despite its rather barren appearance from sea, because of the proliferation of springs and fertile soil in the valleys, Tilos is known for its figs, almonds, walnuts, and olive production. A gorgeous sandy beach extends along the shores of Eristos Bay. It's reputedly the best beach on the island. The anchorage is scenic and well protected. Facilities: Limited dockage is available at Livadia. Water is available. Car and motorbike rentals are available. Tilos Island to Khalkis Island - 20 nm. Your Kos Itinerary takes you farther to the southeast, giving you yet more relaxing off the wind sailing between the islands. The small isle of Khalkis lies just a few miles west of the big island of Rhodes, which dominates the horizon from a great distance. Quiet, serene, and breathtakingly beautiful, rural Khalkis is a jewel of the Dodecanese Islands. Sailing into the tiny port of Emborios, once a major sponge fishing center, is like stepping back in time. On a ridge are a series of old windmills, and beyond Horio, now abandoned, is a fortified castle dating back to the Middle Ages. Several tavernas are in the village of Emborios. Going ashore to explore is a pleasant way to spend an afternoon and early evening. Mooring: No moorings are available. Anchor off the village of Emborios. 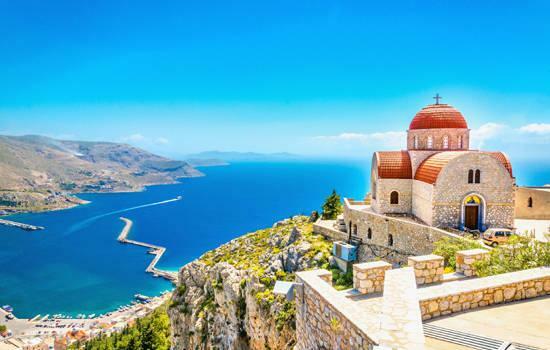 Things to do: Khalkis has an area of 23 square miles and is one of the smallest of the Dodecanese Islands, but it has an astounding 360 churches, chapels, and monasteries, many dating back to medieval times. Like many other Greek islands, it has an ancient capital settled thousands of years ago by the Carians, Dorians, and Phoenicians, to name a few, that was subsequently built on in the 1200s when the Venetians and Genoese arrived. Many of the historic sites are close to the main port of Emborios. St. Nicholas Church is particularly impressive. Within the village are a few tavernas, where you can enjoy a delicious seafood dinner and a refreshing cocktail after a pleasant walk on the winding roads of mountainous Khalkis. Facilities: Fuel and water is available. Khalkis Island to Rhodes Island - 36 nm. Sailing along the west coast of Rhodes gives you a feel for the grand scale of this mountainous island, the largest in the Dodecanese. The tallest peak, Mt. Ataviros, rises 3,953 feet, and is forested in pine trees. Groves of olive, orange, fig, and lemon trees occupy the lower slopes. Butterflies abound, drawn by the proliferation of jasmine, hibiscus, and bougainvillea, giving Rhodes the nickname Island of the Butterflies. As you reach the northwest end of the coast, you'll be treated with the sight of picturesque and ancient Rhodes Town, parts of which date back to 400 B.C. Docking in the harbor of Mandraki at Rhodes is ideal because it puts you in a great place to fully explore the island, to sample the excellent cuisine, and to enjoy the lively nightlife of the city. Mooring: Some moorings may be available. The best anchorage in the three harbors of Rhodes Town is Mandraki, which is highly protected and incredibly scenic. Most sailors tie up at the piers. Other anchorages can be found in the other two harbors as well, but they aren't as desirable. Things to do: The attractions of Rhodes Town are many. The beaches are exquisite, the cuisine is superb, the nightlife is lively, and the shopping is second to none within the Dodecanese Islands. All manner of sports activities are available, including golf. There's also a casino for sailors interested in trying their hand with Lady Luck. A visit to Rhodes Town wouldn't be complete without a foray into the Rhodes Acropolis (circa 3rd century B.C. ), with its temples, public buildings, and underground vaults. Archaeological excavations began in 1912 and continue today. Many of the extraordinary artifacts and artworks unearthed at the acropolis and elsewhere are on display in the Archaeological Museum of Rhodes, housed in the Hospital of the Knights (of St. John) completed in 1489. On the east coast is the acropolis of Lindos, with an excellent harbor and picturesque beaches. Inland is the Valley of the Butterflies. Rhodes is rich in trees, flowers, and shrubs, which attract tremendous numbers of butterflies. Rhodes is nicknamed Island of the Butterflies for this reason. It is also called Sun Island because of its more than 125 sunny days every year. Rhodes sailing could easily occupy an entire Kos yacht charter. Rhodes Island to Symi Island - 23 nm. 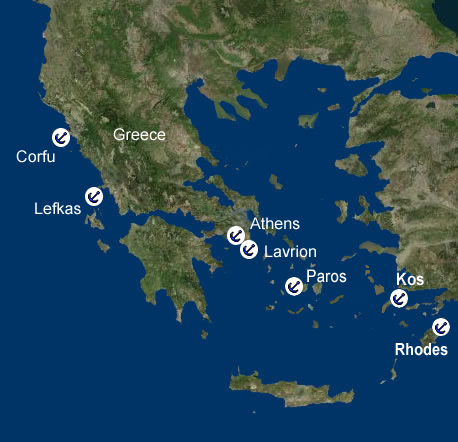 Your Kos sailing itinerary takes>you northwest from Rhodes to the incredibly scenic island of Symi, long a favorite vacation destination in the Aegean. Indented with numerous secluded coves and bays with superb beaches, Symi is a sailor's paradise. Heading north to the end of the island brings you to the picturesque port of town of Gialos, with its lively harbor, opulent mansions, sundry boutiques, and a wonderful selection of excellent waterfront restaurants and cafés. There are two museums to explore. Just waking through the town is delightful. Mooring: No moorings are available. There are numerous good anchorages at Symi. In the main port of Gialos, on the northeast end of the island, the best anchorage is on the south side of the bay in the cove just south of the clock tower, a major landmark in the town. To the south of Symi bay is a narrow, fjord-like inlet at Pehti, an extremely beautiful spot with excellent protection from westerly winds (it's within walking distance of the main port). In fact, the entire east side of the island is indented with picturesque coves perfect for anchoring in an idyllic and tranquil setting. The west coast is more rugged and exposed to the westerly winds, making it much less desirable for anchoring. Things to do: Symi is a popular tourist destination. It has beautiful beaches, a thriving downtown district in Gialos and Chorio (the upper section of town), and a host of events and festivals. The restaurants, tavernas, cafés, nightclubs, boutiques, and markets are among the attractions. The Museum of Symi has a fascinating collection featuring artifacts from important archaeological digs as well as folklore exhibits that highlight the rich cultural history of the island. Churches and monasteries pepper the Greek isles and Symi is no exception. Of particular interest is the monastery of Moni Taxiarhou Mihail Panormiti at Panormitis Bay. It also houses a Byzantine and folklore museum. You can rent a car to tour the island. Water taxis are available to take you to scenic beaches. Many of the beaches are also easily accessible aboard your yacht. Symi Island to Kos Island - 60 nm. The final day of your Kos itinerary takes you northwest, leaving beautiful Symi behind as you trim the sails for a windward crossing. The scene inspires the imagination as you consider all the history of this part of the Mediterranean. As the balmy wind fills the sails of your yacht, you will find yourself reveling in the special charm that can only be found in Greece. Arriving back at the base in Kos by 5:00 P.M., you'll have plenty of time to enjoy a sumptuous dinner at one of the restaurants near the marina, a fitting end to a leisurely foray into one of the best cruising grounds on Earth. Mooring: No moorings are available. Kos Town is a picturesque and ancient city built along the shores of a nearly landlocked bay. Typically, sailors tie up at the modern marina, but there is an anchorage off the castle on the east side of the harbor. On the southeast coast is the beautiful resort harbor of Kardamena. Kamari Bay farther down the southeast coast is also scenic and protected from northerly winds. Things to do: Kos Town is famous as the home of Hippocrates, commonly known as the Father of Medicine. A majestic tall plane tree (a kin of the sycamore) in town is said to be more than 2,500 years old. Hippocrates supposedly taught students the healing arts beneath its expansive leaves, and whether true or not, the specimen is well worth admiring. About 2.4 miles from Kos is the Asklepieion, the first medical institute that Hippocrates founded. Taking a tour of the harbor's castle, built between 1391 and 1395 by the Knights of St. John, is fascinating. The views from the ramparts are superb. The Archaeological Museum of Kos has a wonderful collection of artifacts from local digs. After a restful night aboard, disembark from your yacht at 8:00 A.M. and prepare for your flight home.